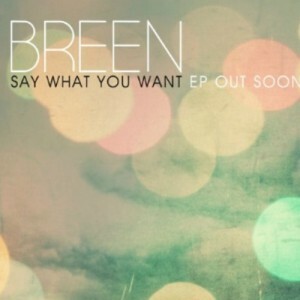 Breen’s Say What You Want opens with the title track and immediately a slow droning tangles itself around lush, lighter vocals. Production plays with pace, speeding up and slowing down where appropriate to create an eclectic, varied sound that is clearly the London-born artist’s trademark. ‘Twisted’ is next, a tighter, more focused sound that grabs attention straight out of the gate. The content of the song contrasts nicely with the breezy, but punchy beat. ‘Twisted’ points to Justin Timberlake influences, with Breen’s voice sounding a lot like the NSYNC-er turned global superstar. ‘Kicking Back’ is the EP’s most up-tempo jaunt, with 80’s nods evident throughout the dance-ready track. The last track on the short offering is ‘Through’, which starts out sounding a lot like an R&B slow-jam, but transforms in to something almost country. Piano drives the track and the languid pace makes for a chilled-out, lulling listen. Breen is Matt Lamb, a 22-year-old producer/singer/songwriter. Thanks to artists like Frank Ocean and James Blake, there’s a lot of room in music at the moment for male artists who make reflective, atmospheric tunes, so Breen has hitched his wagon to the right genre. Being a singer, as well as a producer is a sought out skill in music’s current climate and on this Breen delivers. His layered beats and beautiful vocals are a sophisticated match, and his melting pot sound of R&B, electronica and funk is enough to warrant multiple listens. This entry was posted in Uncategorised and tagged Breen, electronica, R&B, Say What You Want. Bookmark the permalink.